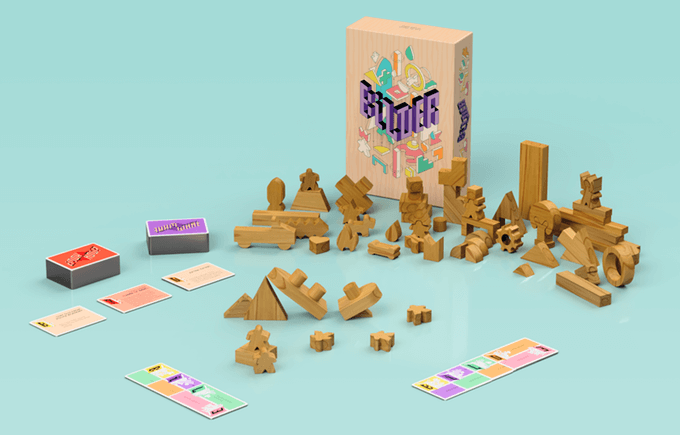 Bilder by Monkeyshine Games is a social party game for 2-12 humans which challenges you to depict a prompt using an assortment of wooden building pieces, and hopefully have the other players guess what you’ve created! It’s like if Charades let you use meeples to orchestrate a one act play that only your friends showed up for to “be polite”. Each WHAT card contains a category (B - Beings, I - Imagined, L - Locations, D - Devices, E - Events, R - Rest (as in, “the rest and anything else that doesn’t fit”)) which the bilder reveals to the other players - this is their only hint when they’re trying to guess the word you’re depicting! Guess a word correctly to earn that card, and each card you earn scores you a point. The first to collect one of every letter and spell out “BILDER” finishes the game, earns 3 more points, and the player with the most points gets bragging rights! Sound simple enough? Let’s add in an extra challenge then! Obviously you don’t have a chance to guess when you’re the bilder, but you can earn points by attempting a HOW card. These cards throw a spanner into the works with unique challenges and restrictions that make bilding more difficult, such as using a limited amount of pieces or having to use chopsticks to create your bilding. If you want to be crowned the best Bilder in all the land, you’ll need to challenge yourself with these to earn extra points! Think It. Build It. Nail It. Like any social game, Bilder is all about the people you play with. It’s got that familiar simplicity like Charades or Pictionary, which makes it perfect to teach to anyone, while adding a bit of variability and challenge with the HOW cards. We played this game with our regular gaming group before sinking in to the heavier games of the night, as well as with our parents. All of the plays were filled with outrageous laughter, puzzled frustration at bad guesses, and regretful questioning of our partners’ cognitive function. One concern I find with games that have trivia-like prompts (such as Time’s Up! and Pictionary) is that pop culture references can fall flat when they’re not as broadly known, but the game alleviates this by offering the designated bilder 2 choices per card. We never had anyone draw a card and not understand either of the options, although if this happened you could just agree for them to draw a new one. The choice of what to bild can also be a nice strategic element, as I found myself often picking the category that would keep other players away from completing their “BILDER” set. Let’s be real here though - this is a casual party game that can be played as seriously or lightly as your group determines (you don’t even have to finish once the game end triggers if you’re having enough fun). A set of Bilder comes with 40 different blocks for you to stage and manipulate into the prompt, and it requires you to flex your creative muscles hard! Some of the more difficult words and phrases we ran into during our games were “Pokemon”, “the stabbing of Julius Caesar”, and “Michael Jackson”. One of my favourite moments was when Phoebe’s mum was given the prompt “Monopoly” with the added challenge of a HOW card requiring her to create a tableau hidden from the other players before a giant reveal. One tea brew break later (for non-tea fiends, this converts to approximately 4 metric minutes), we came back to find this pretty decent display of a game board complete with Free Parking! It's the Free Parking that gives it away! It’s fascinating to see the creative solutions that players come up with to depict the abstract or obscure word that they’re challenged with bilding, as well as how everyone else views the VERY OBVIOUS bilding you’ve created. - When something seems so clear to you, it’s hilariously frustrating when the other players are left gawking like idiots (or in my case, just screaming the words “graveyard”, “cellphone”, and “Vatican” in rapid succession because damn it, I totally saw any of those represented with the same set of blocks in a matter of seconds!). One round, Phoebe had the prompt “fortune teller”, but her mum got the ability to remove a piece every 5 seconds. Cue the mad scramble to grab the architecture to construct a tent with a meeple precariously staring into a sphere inside it. “Circus!” we cried out. When that failed, Phoebe’s mum removed the meeple. Phoebe grabs another one and vigorously shakes it for dear life, slamming it on the table expectantly. “Ringmaster?” “Lion tamer?” “Acrobat?” The sphere is suddenly removed from play. That’s when my brain melted, and I started shouting out random nouns. The tent is removed from play. Table slamming gets harder, and now the meeple is doing a weird summoning motion around the void of where its crystal ball once was. Finally after the second meeple is removed from play, resignation sets in, and contagious laughter takes over the room from the revelation that we were oh-so-close-yet-so-far from! It’s that frustration, that ingenuity, and the downright stupidity that gets thrown around that makes this game so delightful. This game is definitely designed for families, or game groups as a nice filler for the evening. It’s the kind of game that pairs well with a lovely brie and a swirl of red wine. I think the use of blocks rather than abstract body gestures also means children will have a blast constructing their wild creations. After all, for us it was just an excuse for full-grown adults to play guessing-game Lego. Because it highly depends on the communicative abilities of your opponents, be prepared to see the heightened frustrations of people’s personalities - don’t play with people who don’t play nice. Similar to Punderdome or Funemployed, it’s also a game that won’t sit as well with people who are self-conscious about their wit or creativity being put on display. The game comes with 40 different wooden pieces (or 80 if you back the double pack). 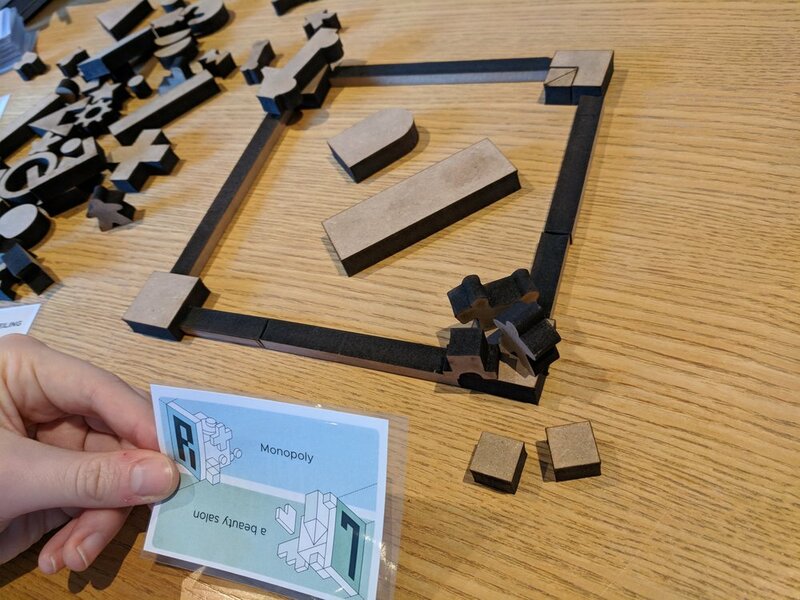 Our review copy had MDF laser cuts, and while they were durable and tactile, the campaign promises to deliver beautiful solid wood pieces with a light natural-looking varnish. One really nice touch was how some of the pieces interacted with each other - that piece that could serve as a tee-pee also doubled as a wizard hat that slotted perfectly on top of the meeple pieces. That piece that looks like a bone? Slot that bush piece on top and it’s suddenly a tree. You won’t be strapped for opportunity to create - some pieces are obvious in what they are (the dog, the car, the flame) whilst some are generic blocks and shapes that allow you to craft your own designs. These are both adorable and ingenious. It was a little curious that some of the HOW cards were challenges that made your life harder, while others made the process easier, yet they had equal point values. However, this is a fairly minor concern, because if you’re playing to finish the “BILDER” set first, you’ll occasionally take the hit on tackling a challenge if it gets you closer to your endgame. These people are having fun - why can't you? Overall, the game plays as well as the people you’re playing with. The more comfortable you are with the other players (and the better you know them), the more you’ll be able to experience the fun that Bilder has to offer. Because you’re playing with a few more decisions than a typical social game (select a challenge, then select a word, then select what pieces you’re going to use) some players found there was too much downtime between rounds, especially when combined with a really easy word to guess. That being said, I personally didn’t mind this as I was enjoying the company I was keeping! Bilder is a game that will keep you on your toes and wring out your brain’s creative juices into an abstract mess of wooden masterpieces. The HOW challenges keep things lively, and who doesn’t want an excuse to see their family squirm in agony at their futile attempts to guess “forest fire”? It wasn’t that hard, guys. Seriously! If this sounds like something that you WOOD like, head on over to their Kickstarter - which is live now! As always, thanks for reading! If you enjoyed this post, please consider sharing it with your friends and following @CardboardVault on your social media of choice. You can also help fuel our work by supporting us on Ko-Fi! Just click the button below to buy us a dose of caffeine.